There are many veterans who have bravely served their country; my dad, Allen Covington is one of those men. He was in the United States Navy for twenty years, from 1973 until 1993. During this time he was assigned to four ships and four land assignments, from Washington DC to Diego Garcia in the Indian Ocean. He saw limited combat in Vietnam and participated in the masters-at-arms or onboard police/security program on one of his ships. All of the following comes from an interview with my father on November 25, 2011, except as noted. My father was born Allen Ray Covington on November 2, 1953 in Paris, France to John and Reba Covington. His father was serving in the United States Army and was stationed over in France. The hospital on base was an old converted barn, so my dad can actually claim that he was born in a barn. By January 1954, my Grandpa had been reassigned to Lacey, Washington right outside of the capital Olympia. Growing up, my dad enjoyed the company of his two siblings, his older brother of five years John Jr., and later his younger sister by three years Kay. The one thing my dad resented about his fathers’ service was the fact that they were required to move every three years as he was assigned to a new duty assignment. He would no sooner start to make good friends with kids in school, and my dad would then have to move away, many times out of the country. He also had to repeat the second grade because he missed a month of school during a move. In 1957, my dad and his family moved to Okinawa in the Pacific Ocean. My dad vividly remembers playing on the beach and seeing burned out pillboxes from the American invasion in 1944 as part of the island hopping campaign of World War II. The most terrifying occurrence there however was when my dad and his friend Patrick were playing in the sandbox and found an unexploded 500lb. bomb buried at the bottom. The bomb squad had to quarantine the entire housing complex until the bomb was neutralized. After Okinawa, my grandpa was assigned to a base in Nebraska, where his task was to notify families that their loved one(s) had died in Vietnam. For this reason, he was not very popular and was forced to live on the outskirts of town, literally the other side of the tracks. By far, this was the hardest environment for my dad to grow up in, as he made even fewer friends than normal. The ordeal however would last much further. My grandpa finally retired from the army in 1968, and they again returned to Lacey, Washington. My dad at this point was in eighth grade. He now, finally, had a stable environment to mature in. He quickly became involved in sports, including wrestling, baseball, and basketball, but predominantly football. He made a name for himself as a running back and receiver, but played on the line as well. He became quite fond of the rock and roll music of the time, although his father did not quite approve. He graduated high school in June of 1973, enjoyed a brief summer, and then embarked on his long and distinguished naval career. My dad enlisted with his good friend Steve, and both were sent to San Diego for boot camp. This was the first time my dad had ever been to California, and he was amazed by the absolute difference in weather compared to Washington, where he claimed you only saw the sun for four months out of the year. Arriving in San Diego, my dad was unsure of the events ahead. In time however, he found it to be nowhere near as bad as he feared it might be. During my dad’s senior year, he had four physical education classes, only one of which was in a teacher’s assistant capacity. This meant that once a month, my dad would have to run four miles, on top of any sports practice he might have had. Because of this, he actually gained weight in boot camp as the most strenuous activity was mere marching. At the end of the six months, he graduated in the top ten percent of his class and was given his first duty assignment. 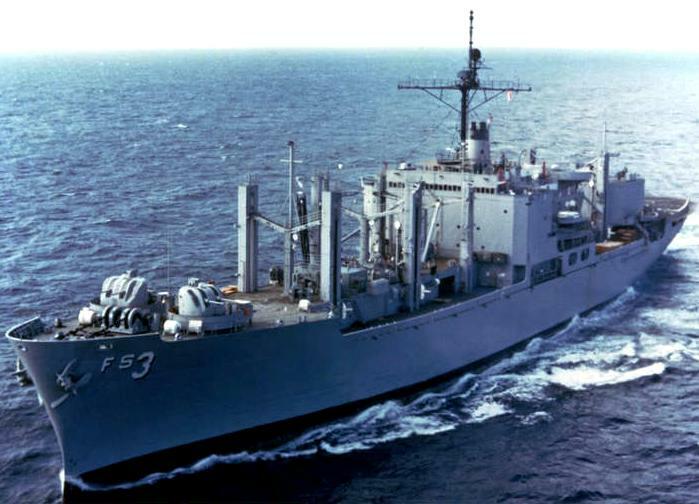 Both he and his friend Steve were transferred to the USS Truxtun, a cruiser which had already seen much action in Vietnam (wiki/USS_Truxtun_(CGN-35)). Of all my dad’s various duty assignments throughout his twenty year career, his first ship stands out as his favorite because it is where he learned many of the skills he would later master down the road. When my dad first came aboard the ship, his rank was just an SH3, or ships handler third class, meaning he did not have a specific department he belonged to. This meant he worked wherever he was needed, which was usually under the supply division. At first, the ship was operating under its; initial designation of CG, or guided missile cruiser. At this time, it was still powered by its’ original diesel engines. Within five months of his arrival however, the ship made port at the Bremerton Naval Yard in Washington for a comprehensive eighteen month overhaul, where the ship was converted from diesel to nuclear propulsion, necessitating its eventual reclassification as a CGN, or nuclear powered guided missile cruiser (wiki/USS_Truxtun_(CGN-35)). As with any major work on a naval vessel, the ship must undergo sea trials before returning to active duty. The purpose of the sea trials is to certify that the work done has been completed to a satisfactory level. Exercises include tests to ascertain the agility and performance of the ship, as well as tests to confirm that the weapons systems are in full functioning order. During one such exercise, the Truxtun left her home port of San Diego for San Clemente Island off of Los Angeles. The island is owned by the Navy and used solely as a gunnery range for practicing naval gunfire support. On the way to the firing range, the alert was given that the ship was going to flank, or full, speed ahead to test the new nuclear reactors which deliver over seventy thousand horsepower (wiki/USS_Truxtun_(CGN-35)). All lightweight items were stowed away as the whole ship shutters under that much strain. My dad went topside and went aft to the fantail to get an idea of what speed they were doing. To his amazement, there was a forty foot roostertail of water rising astern from the immense speed the propellers were rotating as the ship was thrust forward at upwards of thirty-five knots or 52.5 miles per hour! When they arrived on station, they were greeted by a boat containing protesters protesting against the military. The captain hailed the other vessel and informed them that they were in restricted waters and they were to proceed out of the area immediately or the Truxtun will commence gunnery practice on the island despite their presence. The protesters craft refused to depart the area, so the captain gave the order commence fire. The ship fired ten to twelve salvos over the protesters’ vessel without any harm befalling them, but they stayed in harm’s way. Fed up with their disregard of his order, the Captain gave another order. This time, the Truxtun made a high speed gunnery pass, coming within fifty feet of the intruding vessel, swamping and capsizing it with its wake. Upon survey that no one aboard was injured, the Captain informed the Coast Guard that they needed to retrieve several stranded persons in the water, and continued with the mission at hand. After the ship passed all of its tests, the ship returned to action off the coast of Vietnam. It was tasked with the dangerous duty of transiting the Gulf of Tonkin every time an aerial assault was returning to base in the event that one or more planes was damaged and needed to make an emergency landing so as to provide search and rescue aid. They would get so close to the Vietnamese mainland that they could see the faint glow of the fires caused by the raids on the horizon. This also meant that they were within the range of Vietnamese artillery and retaliatory airstrikes, and on at least one occasion, enemy aircraft were vectored towards them but were unable to locate the ship. One of my dad’s most traumatizing experiences occurred on one such recovery mission. My dad was in the recovery boat that responded to a downed Air Force plane that went down in the gulf. Prior to splashing down, the pilot had buzzed the boat, happy knowing that he would soon be rescued. After he ejected from the stricken aircraft, he took off his gloves and helmet as he slowly descended to the water under his parachute. Within twenty seconds of him hitting the water, the rescue launch got to him, but the pilot was unresponsive. Unfortunately for him, he landed in a ball of mating sea snakes, which are highly venomous. The doctors later determined that he had been bitten over seventy times, spelling his certain demise. It was leaving the Vietnam conflict that my dad’s life was put into jeopardy for the first time. During transit back to San Diego, the ship encountered a typhoon that they could not avoid. One night, while transiting the storm front, part of the railing on the starboard bow became dislodged by the extremely violent seas, which were heaving the deck of the ship up and down by an increment of fifty feet or more. My dad and a crew of nine other sailors were tasked with navigating the treacherous decks to go secure the damaged portion of railing. Eight of the men stayed near the island of the ship, while my dad and another man were sent out to the edge to make the necessary repairs. The only thing protecting the two was a rope tied around their waists held by the other eight. As my dad and the other guy were almost at the edge of the deck, they looked back and saw the other eight running for cover. Naturally surprised, they searched for the cause of their distress. The bow of the ship was pointed nearly straight down as it plunged into a massive wave. The first sixty feet of the Truxtun’s bow was submerged in the frigid water for several seconds before surging back to the surface. After it did, my dad and the other sailor found themselves dangling overboard, with only the rope supporting them as it straddled a part of undamaged railing. While it was only about twenty to thirty seconds before the other eight pulled them back to safety, to my dad it seemed like an eternity. Upon being brought to the infirmary, the medics said that he was on the verge of hypothermia due to the frigid water. While extremely uncomfortable, he was thankful to his superior for releasing him from standing his watch that night, where he would have been back outside for another four hours. Outside of these two traumatic experiences, life aboard was rather enjoyable. One moment that causes my dad to laugh still was when on another operation close of the coast of California, they were cleaning the deck but were constantly having to redo areas where the seagulls would poop on it. One of my dad’s shipmates had the idea to go grab two supplies from the ships store: Alka seltzer tablets and Ritz crackers. Bewildered by the items he returned with, he began tossing the Ritz crackers in the air and on the deck, and naturally the seagulls began to eat them. After a brief while, when the birds had become accustomed to eating anything he threw, he switched to the Alka seltzer tablets. The seagulls, not being able to release the rapidly building gasses in their stomachs, eventually exploded and fell into the sea. This in turn created a shark feeding frenzy after the ship. As more and more of the crew became aware of the events, word spread quickly throughout the ship. When word reached the radar technicians, they decided to up the metaphorical ante. They put out word for all men up in the masts to go down to the maindeck level for their safety. When everyone was clear, they took manual control of the air search radar, which is effective out to two hundred miles. They pointed it up at the circling flock of seagulls and turned it on…every single one immediately fell into the ocean, reinvigorating the feeding frenzy. As with any duty assignment, they are over in three years. After the Truxtun, my dad was sent to Guam in the Pacific. While there, he attained his diving certificate and frequently dove on the extensive coral reefs in the surrounding waters. From Guam, he was stationed aboard the USS Proteus, a World War II vintage submarine tender overhauled to tend the modern ballistic missile submarines of the fleet. After the Proteus, my dad was stationed on Diego Garcia, a British Commonwealth island in the Indian Ocean. After there, he became assigned to the USS Mars, an attack food ship (AFS). 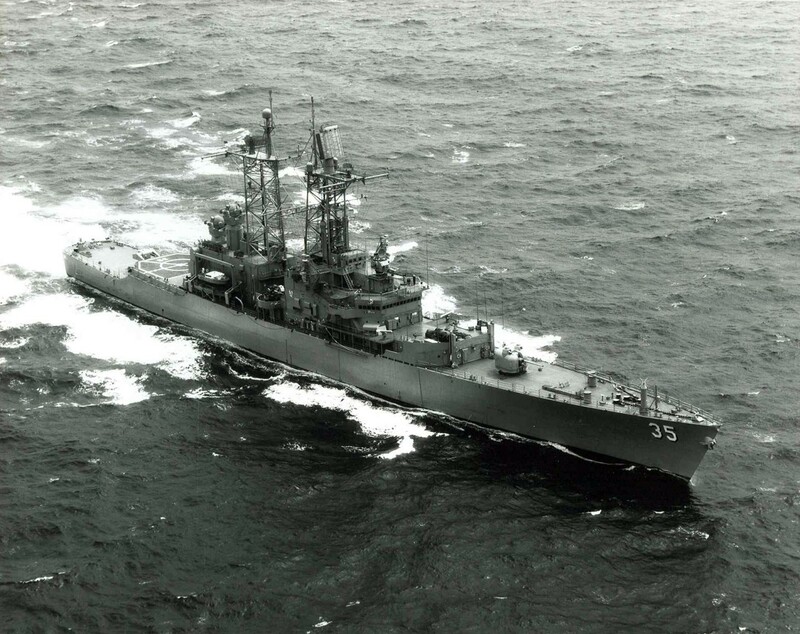 It was on this vessel that possibly the second most terrifying moment of my dad’s naval service occurred. At the height of the Cold War between the United States and the Soviet Union, the Navy decided to test the Russians to see their reaction. They wanted to see if they could operate three carrier battle groups in the northern Pacific off the coast of Alaska. Normally, each battlegroup would have its’ own AFS to supply it, but the other two in the Pacific fleet were non-operational for one reason or another. Now my dad’s ship had to carry the supplies for three battlegroups, or approximately thirty ships and their crews. This meant that the crew of the Mars had almost no supplies left for themselves as most of it was to be given away. One morning, while near Soviet waters, they awoke to find six Russian warships in very close proximity to them, with their guns and missiles pointed at them. The navigator was immediately summoned to guarantee that they were in fact still in international waters and had not strayed into Russian territory. The Russians were pulling alongside, within thirty feet of the Mars and throwing potatoes at them, then stopping right in front of them forcing the Mars to alter course around them. Audible above the clouds, were Russian aircraft undetectable as the Mars had no radar or sonar. Even more unsettling was the fact that, due to naval formation policy, the closest American warship was fifteen miles ahead, over the horizon. It was six hours before help arrived and the Soviet fleet had decided that they had had their fun, and disengaged. It was while aboard the Mars that my dad, now a first class petty officer (PO1), decided to enter the chaplains’ corps. His next duty assignment was the chapel at NAS Moffett Field, California in Mountain View. It was while here that he met my mom. After a period of dating that lasted nineteen months, they were married on July 18, 1987. Shortly thereafter, he was assigned to the USS Tarawa, homeported out of San Diego again, so they moved down to San Diego. I was born on September 11, 1990 in Balboa Naval Hospital where my dad was lucky enough to be off that day so he could be there. In October, my dad got his last orders to Washington DC, so we packed up, and made the three thousand mile drive across the country. His last job was in the headquarters of the Chaplains’ corps, which required occasional visits to the Pentagon for meetings.